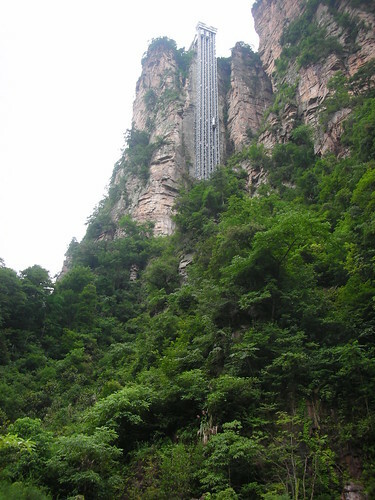 Bailong Lift built onto the side of a huge cliff in Shuirao Simen Scenic Area of Zhangjiajie National Forest Park, China holds three Guinness World Records. 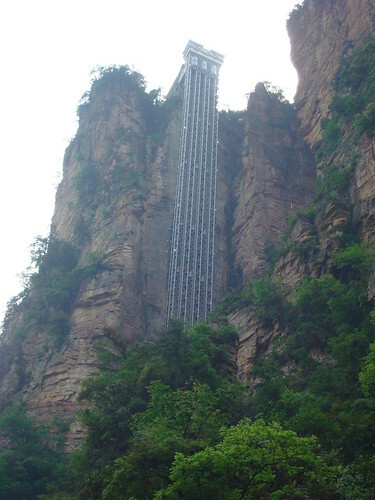 Highest totally exposed outdoor lift with an height of 336 metres. Passenger lift with the largest carrying capacity ( 46 persons) and quickest speed of 3 metres/sec. The lift has three glass capsules which take just one minute and 58 seconds to travel the full height. Construction of the lift was started in September 1999 and it was completed in April 2002. Reportedly the lift is causing environmental concerns and it future is uncertain. Remarks regarding location: Because of low resolution imagery I was not able to pin point the exact location in Google Earth. I have presently marked the location based on Panoramio/Flickr images and will correct it as and when I get some accurate information. I seek help from my readers in this respect. Source of info: Wikipedia and Flickr Image of the plaque installed at the Lift.